The Oxford English Dictionary places the word’s first use in the 1699 book Voyages and descriptions by William Dampier: “[T]hey are called by the English seamen Chopsticks”. Archeological excavations in China date the earliest prototypical chopsticks as far back as 5000 BCE, but chopsticks were used to cook and prepare food at first, rather to eat. During the Bronze Age, for example (1600-1046 BCE) food was boiled in cauldrons on tripod feet, a cooking method that works nicely with a pair of long wooden chopsticks. As for eating, the leading implement during China’s first few thousand years was a dagger shaped spoon called bĭ, 匕 , used in conjunction with the fingers. 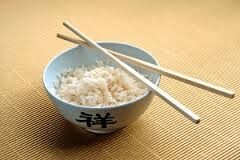 It was not until the 4th Century BCE that the majority of Chinese were eating with chopsticks. It has been often noted that chopsticks are particularly well suited to Chinese cuisine and its bite-sized pieces; indeed, the practice of serving large portions of meat, requiring individual diners to use knives, is unknown in China. Knife work belongs in the kitchen, a belief with roots in Chinese philosophy. As Mencius, disciple of Confucius, said: “So is the superior man affected towards animals, that, having seen them alive, he cannot bear to see them die; having heard their dying cries, he cannot bear to eat their flesh. Therefore, he keeps away from his slaughter-house and cook-room.” Chinese cuisine ensures that all dishes are tender and bite-ready, requiring nothing more than a slim pair of sticks to convey them to the mouth. The word “pair” is key, for chopsticks can only exist in twos; one is useless without the other. This simple fact has made chopsticks a favorite gift and a popular, lucky symbol for lovers, couples, and newlyweds. The utensils figure widely in love stories and folklore. They frequently serve as a prop in wedding ceremonies, in ways that vary widely across China, from the Klau people of Guizhou Province (the groom’s mother carries chopsticks wrapped in red paper to the bride’s family to propose marriage) to the Daur people of Manchuria (the bride and groom eat a bowl of glutinous rice together, using one pair of chopsticks). In some parts of northwest China, a bride throws a pair of chopsticks on the floor as she leaves her old home, and as soon as she walks into her new one, picks up a new pair of chopsticks. Lucky associations with chopsticks also extend to the spoken word, kuàizi, which sounds similar to the words for speed, happiness, and son—all very propitious. 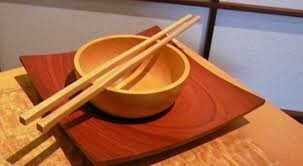 –do not use chopsticks to dig or mine for food in serving platters, or to impale food. –do not leave chopsticks standing vertically in food, as this resembles incense sticks in a funerary offering. –do not use chopsticks to make noise, to gesticulate, or to point at someone. –it is acceptable to transfer food directly to close relatives or significant others, but it is increasingly the norm, for reasons of hygiene, to use serving utensils (spoons, or serving chopsticks) to convey food from platters to individual plates, whether serving oneself, or another. In fact, a 2006 Hong Kong study found that, following the SARS epidemic, the percentage of people who used separate utensils when serving food from platters climbed from 46% to 65%. The biggest problem posed by chopsticks is not the occasional lapse in hygiene, but rather the huge and environmentally damaging market in disposable chopsticks. Most of these are consumed in Japan, where throwing away chopsticks after a single use is a powerful, ubiquitous trend that resists reversal. Japan gobbles up 24 billion pairs a year, or 200 pairs per person. While Japan uses disposable chopsticks in all kinds of restaurants, through the rest of Asia, throwaways are a bottom-end utensil, limited to fast food, street stalls, and casual joints. In China, outside of this bottom tier, reusable chopsticks of melamine or wood are the norm. Japan may be the leading consumer of this wastefulness, but China absolutely feeds the problem, producing about 45 billion pairs of single-use chopsticks every year, the timber equivalent of 25 million mature trees. In 2006, the Chinese government levied a 5% tax on disposable chopsticks, but whether this will actually slow the throwaway-chopstick industry down—or simply increase the Chinese government’s tax revenues—remains to be seen.